September 2018 | InChem Corp.
Manufacturers use thin film evaporation to purify temperature-sensitive products. In this process, separation is created by a turbulent liquid film at the heat transfer surface of the evaporator. 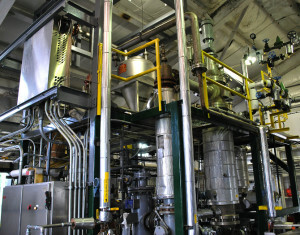 Known as “thin film distillation”, it occurs in specialized equipment that generates the film using intense mixing at the surface of the evaporator cylinders. Where fraction is not required, thin film distillation is typically preferred for its high evaporation rate and shorter residence time resulting in less heat history. The process is also referred to as wiped film distillation. Along with a short residence time, this process offers low pressure drop configuration to enable the reliable and continuous processing of heat-sensitive, fouling or viscous materials without causing degradation.